This sword belongs toJyo Jyo saki ranking. Blade length : 59.6 cm or 23.46 inches. Sori :cm 0.6 or 0.23 inches. 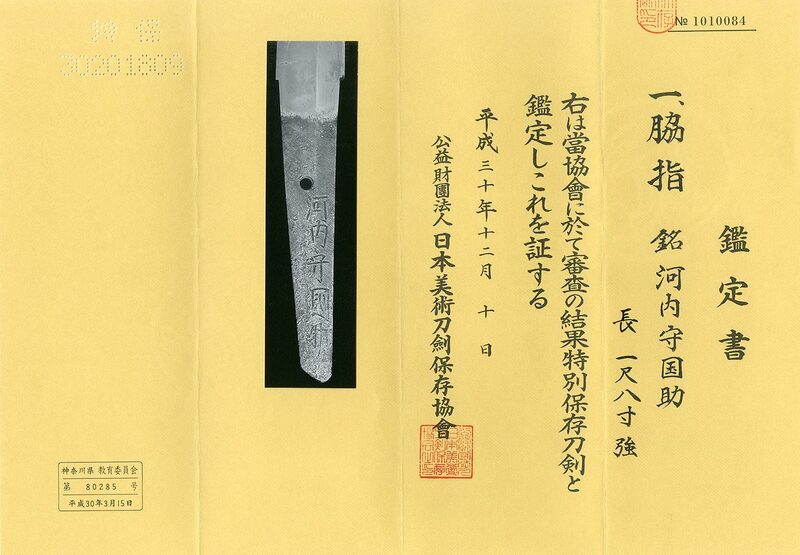 Width at the Kissaki : 2.07cm or 0.81 inches. era.Era : Edo period Kanbun era. and thick wit small sori and regular size Kissaki. with jinie attach beautiful nice texture. On the Sashi Omote side, there are 5mm Kitae-Ware around the Hamon. And on the Sashi Ura side, there are tiny rusts. But it is not serious. And it is not not easy to find. choji midair mixed Kobushi cyoji work with deep nioikuchi. he is also called Shinto-Ichimonji. in modern times. Kunisuke's sword has a tendency curved slightly. with deep nioi-kuchi though the ara-nie is a weak point of Kunisuke the Second. open work and gold color. Menuki : On the syakudo plate, sea bird and wave are engraved. and splash are engraved with gold color. Aoi Art estimation paper : NBTHK Tokubetsu Hozon Token.